TAG Heuer's Monaco has had a close relationship with race car driving for over 45 years. The unique, square, stainless steel watch is powered by an automatic movement and features a stopwatch function, enabling it to time precisely. Rectangular watches are rare, and square watches even more so. The Monaco, with its distinctive square case, is an exception. CEO Jack Heuer designed the watch himself. Most of the newest varieties have a 39 x 39 mm stainless steel case, keeping them close to the original look from the early 1970s. TAG Heuer is most well known for their sport chronographs, and the Monaco is a prime example. Racing fans from all corners of the globe know the Monaco from the 1971 film Le Mans. Steve McQueen wore the watch on his right wrist in the film. Since its film debut, the Monaco has become a famous timepiece. However, the watch has many attractive qualities that go far beyond its cult film appearance. A unique combination of technology and design transforms the Monaco into a milestone in the history of watchmaking. It was the first square, waterproof automatic chronograph. Its namesake is the Monaco Grand Prix race, one of the most celebrated and prestigious races in the world. Today, TAG Heuer offers the watch in many different versions and sizes, including some with a black or open-worked dial. If you're looking for a Monaco that closely resembles the original models, then take a look at the Calibre 11. It has a left-side crown just like the original. A new Calibre 11 with reference number CAW211P.FC6356 costs around 4,000 euros. An original Monaco from the early days is rare today and thus, expensive. Well-maintained watches with reference number 1133 cost around 18,000 euros, though some go for more. The Monaco Calibre 12 bridges the gap between two eras of watches: Its characteristic blue dial is reminiscent of the Calibre 11 models from the late-1960s, but its crown is on the right side of the case, as is common with most modern watches. A new version of the larger Twenty-Four Monaco costs around 8,000 euros. Most other Monaco models, however, are not this expensive. The non-chronograph Monaco Calibre 6 costs less than 2,500 euros when purchased new. If you'd prefer a similar TAG Heuer watch, but with a round case and a tachymetric scale, then you should take a look at their Autavia watch. The Calibre 11 can be identified by two notable features. First, its crown is located on the left side of the case at nine o'clock across from both chronograph push-pieces. In 1969, this layout was necessary for automatic Monaco chronograph movements. According to TAG Heuer, it would now no longer be an issue to put the crown on the right side, as is done with the Calibre 12. However, they have kept the crown on the left side to stay true to the original. 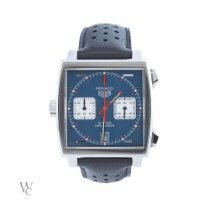 The second special feature of this watch is that its matte blue dial only features the name "Heuer," without "TAG." 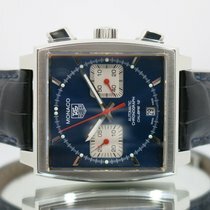 When the original Monaco was released in 1969, the company was known under the name "Heuer." TAG Heuer has only existed as such since the mid-1980s. Leaving "TAG" off the dial keeps the watch closer to the original. The Calibre 11 has the same vintage look of the first Monaco. Its dial is dark blue, but two white subdials at nine and three o'clock brighten it up. The left subdial is the chronograph's minute counter, while the right keeps track of the running seconds. Here the watch differs from its predecessor, as the 1969 Monaco's square subdials were hour and minute counters. The large, central second hand on the newer version functions as the chronograph second hand; the watch doesn't have a traditional second hand, as the subdial keeps track of running seconds instead. The date display is still located at six o'clock. 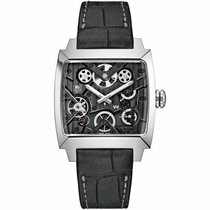 The modern Calibre 11 has 59 jewel bearings, runs at 28,800 vibrations per hour (4 Hz), and has a 40-hour power reserve. Its historical predecessor of the same name was created under a joint collaboration between Heuer, Breitling, and Hamilton-Büren. The ébauche manufacturer Dubois-Dépraz provided the chronograph module. The original Calibre 11 was premiered on March 3rd, 1969, ran at 19,800 vibrations per hour (A/h), and had 17 jewel bearings. Watches with this original caliber have the reference number 1133 and usually sell in the five-figure range. The 1133 Monaco is known as the "Steve McQueen Monaco." The actor received this watch from his friend, racing legend Jo Siffert. Siffert was a brand representative for Heuer and wore the company's logo on his white overalls. McQueen chose to wear the same clothing for his role as the Porsche 917 driver Michael Delaney in the famous film. He completed his look with a matching watch - the Monaco. His original watch from the movie was auctioned off for an astounding $800,000. In his private life, however, McQueen often wore a Rolex Submariner. Another newer Monaco variant is the Calibre 12. Its crown is at the usual position at three o'clock on the right side of the watch. This movement replaced Calibre 11 in the early 1970s. However, the newer Calibre 12s are not simply enhanced versions of the older movement. Instead, they're based on the 2892 caliber made by the world's largest ébauche manufacturer, ETA. A special module from Dubois Dépraz adds a chronograph function to the movement. The Calibre 12's case measures 39 x 39 mm. The 12's hand and dial designs have changed a bit compared to the Calibre 11. The hour and minute hands are entirely white on the 12, while those on the 11 have red color accents. The Calibre 12's dial features the company's entire name, TAG Heuer, as well. It runs at 28,800 A/h and like the Calibre 11, has a power reserve of around 40 hours and 59 jewel bearings. The Calibre 12 is available in a number of different varieties; it's also available with a black case and dial. The Monaco Twenty-Four Calibre 36 is a significantly different interpretation of the Monaco when compared to the other models. It's much larger, coming in at 40.5 mm wide, and has a circular dial placed within a square case. The Calibre 36 is mounted on the four corners of the square stainless steel case. Two gray stripes vertically separate the dial to the left and right of the central axis. A large 24 is featured at 12 o'clock, a reference to 24-hour long-distance car races. The movement vibrates at 36,000 A/h. Thanks to the movement's high frequency, you're able to time to 1/10th of a second using this watch. A smaller version of the Monaco is available in the form of the Calibre 6, which is only 37 mm wide. As its name suggests, the automatic Calibre 6 without a chronograph function powers this timepiece. It has a balance frequency of 28,800 vibrations per hour and a 44-hour power reserve. Unlike the other Monaco models, its date display is at three o'clock instead of six. The small seconds are at six o'clock instead. The Monaco Calibre 6's dial and strap are black, which contrast with the gray and white hands and stick indices. The watch can withstand up to 5 bar of pressure, meaning it's waterproof to 50 m. If you want a Monaco that's waterproof to 100 m (10 bar), then you should take a look at the larger models.